One of the most stubborn fat deposits on the body seems to be on the stomach. No matter what you do you can't seem to get your abs to pop, even if other parts of your body are clearly defined. Many fitness inventions have tried to solve this stubborn problem but few have succeeded. The vibrating belt is an attempt to solve this problem once and for all. Unfortunately the vibrating belt has scant evidence to back up its claims and offers very little benefit. A vibrating belt is a belt that you strap around your mid-section, under your shirt. It produces vibrations by using a small device that oscillates back and forth, much like the vibration in your mobile phone. The vibrations are supposed to stimulate muscle contractions in your abs. You simply put the belt on for thirty minutes and either sit or walk around while the belt works your abs. Over time you're supposed to lose inches off your belly, and there are even claims that wearing the belt can aid digestion because it causes your stomach muscles to contract. These belts are a more modern version of an older piece of exercise equipment, which had a large belt that was attached to a platform and used a machine to vibrate the belt. This machine also produced little to no results and is no longer being produced. 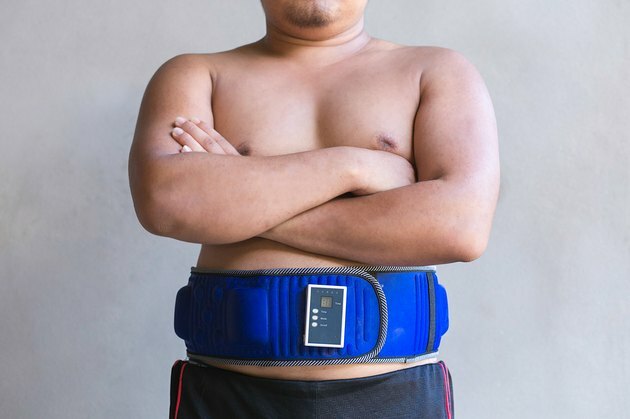 In order to understand whether or not this vibrating belt can reduce belly fat it's important to understand how fat loss works. We lose fat when we are in a negative energy balance, meaning we are using more energy than we are consuming. You can't choose where you lose fat. Your genetics determine where you store and retrieve fat. Ab workouts can make the muscle bigger and help you expend more energy in general, but they can't make you specifically lose fat on your belly. Since you can't choose where you lose fat, and fat loss comes down to energy balance, it makes more sense to modify your diet and perform more taxing exercises than to buy a vibration belt.. While there haven't been any studies on the effects of vibrating belts, vibration technology is not brand new to the fitness industry. There are whole-body vibrating machines that you can stand on which send vibrations through your whole body. There has been some research using these machines which allows us to see what vibration machines can do for you. An article published in the Journal of Strength and Conditioning Research shows that performing squats while standing on a vibration plate is more taxing than without vibration. The researchers found that standing on a vibrating plate caused more activation of the leg muscles and increased the need for oxygen. This shows that adding vibration makes an exercise more intense and causes you to burn more energy. Training while standing on a vibrating plate can also help you build up bone mass and avoid osteoporosis, according to an article in the Journal of Bone and Mineral Research. It's important to note that there probably isn't enough vibration from the belt to provide the same benefits you get from vibration training, so you should stick with modifying your diet and performing difficult and energy-draining workouts if you want to lose belly fat.